In my recent column discussing crabs, I wrote about a group of species called the Malacostraca. This is the taxonomic grouping for the crabs and a lot of other large crustaceans. In that discussion, I used a lot of verbiage to explain that crabs were at the top of an evolutionary pinnacle that includes a lot of other animals, some of which don't look crab-like at all. By examining the characteristics necessary to "make" a crab from some sort of more primitive progenitor, it becomes apparent the most primitive crustacean on the crab lineage really looked nothing at all like a crab. If all of those necessary ancestral conditions are put together, they create a "lowest common denominator," an ancestral set of conditions called The Caridoid Facies. No living animal has all of the characters found in the caridoid facies and neither does any fossil, for that matter. This animal is a "missing link" that shall probably forever stay missing, as it is truly a hypothetical animal, rather like an "honest politician." Nonetheless, one rather successful group of modern animals comes pretty close, at least in a lot of regards, to embodying this character set and gives us a glimmer of what an ancestral crab might have looked like. And, interestingly enough, many of us have these animals in our aquaria. These are the mysids or the so-called "possum" shrimp. Figure 1. A mysid collected from my refuge tank. It was about an eighth of an inch (3mm) long. This is a lateral view. The animal is a male and lacks the brood pouch. Note the shape of the appendages and contrast them to the appendages of the true shrimp in your aquaria. Mysids are small shrimps, common in all marine habitats. Although most of the shallow water ones that hobbyists encounter are small, some deep sea forms range in size upward to about a foot (30 cm) long. The characteristics that specifically categorize a shrimp-like animal into a mysid shrimp, may be best seen by examining the hierarchy of taxonomic characteristics that describe all mysids. The names in a taxonomic hierarchy of terms are not designed simply to be a listing of hard-to-pronounce names to be understood only by anointed elite of the taxonomy. They may be on such a list, but really their function is a lot more mundane. The taxonomic hierarchy may simply be thought of as an address of a precise group of organisms within the larger array of all other organisms. These terms are names of a series of sets of definable and demonstrable characters that can be used to separate and characterize a small group of organisms from the total chaotic array of all animal species. These terms form a series of nested arrays ranging from the most inclusive to the most precise. In other words, we start with the largest group and work to ever more precise, smaller groups. Because they have an integument modified as an exoskeleton and move upon, or with, appendages with obvious joints in them, these animals are placed in the PHYLUM ARTHROPODA. 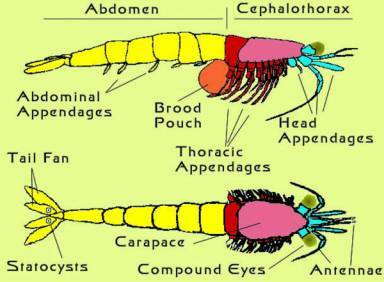 Within the arthropods, they are crustaceans (instead of spiders or insects). That means they are in the SUBPHYLUM CRUSTACEA. These are arthropods with two pairs of antennae. In the primitive forms, their appendages consist of two branches, and they have a particular larva called a "nauplius." There are a lot of crustaceans, but mysids share characters with crabs and other shrimp-like animals, which means they are classified in the CLASS MALACOSTRACA. All Malacostracan crustaceans have paired visual organs, called compound eyes. These are comprised of several to several thousand individual subunits. Additionally, all malacostracans have robust jaws. Furthermore, each antenna typically has two branches, although in some species the second branch is absent. All malacostracans are considered to have eight pairs of thoracic appendages, although in some of the malacostracan lineages, the front thoracic appendages have been incorporated into the head region. They have five pairs of abdominal appendages. Mysids are further categorized within the SUPERORDER PERICARIDA. The name Pericarida means "near to- or close to- shrimps," and indicates that all the animals in this grouping we call a superorder, while closely related to shrimps, belong to a different lineage from the true shrimps. Pericarids have all the characteristics of the Malacostraca, but they possess a few special ones of their own. First, while they do have a carapace, it is normally relatively rudimentary. Additionally, all peracarids have at least one of the front pairs of thoracic appendages modified as feeding appendages, and the females have a brood pouch located at the base of some of the thoracic appendages. 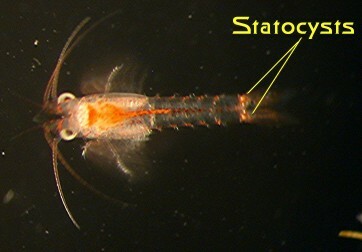 They lack a free-swimming larva, so the typical crustacean larva, the nauplius, is passed as a stage in the pre-hatching embryo. This characteristic really does separate mysids from the so-called true shrimp. All of the true shrimps are in the group called the Eucarida (a name that actually means "true shrimps"). The presence of the brood pouch, in addition to separating the mysids from shrimps, also gives these shrimp a superficial similarity to marsupials, hence the common name, "possum shrimps." Figure 2. A diagrammatic representation of a generalized female mysid (modified after McLaughlin,1980). The abdomen is yellow, and the cephalothorax in red. Although the head and thorax are not distinct, structures assigned to the head are in blue. Compare this diagram with that of the Caridoid Facies and the mysid in Figure 1. Finally, this brings us to the next smaller subdivision, called the ORDER MYSIDACEA. Mysids are pericarids with a well-developed carapace. Although it covers most of the thorax, it is only connected to the anterior three thoracic segments. This carapace is the "mini-skirt" of the crustacean world, and doesn't extend down the sides of the animal far enough to cover the bases of the legs. The legs have two large, evident and almost equal, branches. There are large and evident paired statocysts (balance organs) which are found in, of all places, the tail fan. These latter structures are unique in the crustacea, and their presence serves to identify any small shrimp as a mysid. The statocyst is an organ consisting of spherical structure filled with liquid and containing in its center a small calcareous concretion or "statolith." This small stone is balanced in the center of the sphere on stiff sensory cilia which look like very tiny microscopic hairs. The cells that give rise to the cilia are connected to the nervous system, and as the animal moves or changes orientation, the concretion shifts position, bending the cilia and thereby triggering the nerves to fire. These nervous responses allow the animal to discriminate changes in velocity and orientation. 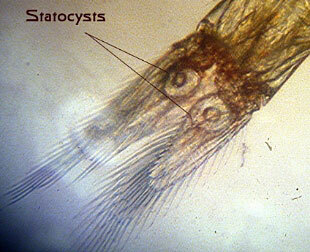 A lot of animals, including a lot of crustaceans, have statocysts, but no other animals have them in their tails. Figure 3. Left. A juvenile mysid showing the position of the statocysts at the base of the tail fan. Compare with the short movie below and note that the statocysts are occasionally visible as bright dots at the back end of the moving mysid. Right. Statocysts showing the concretions in the capsules that comprise these balance organs. The mysids found on reefs, in our aquaria, or those we add to our aquaria as food, tend to be small animals, and like most small animals, they are the food of larger animals. The mysids have opted for the ultimate in camouflage; many of them have become masters of transparency. Additionally, unlike many of the shrimps we are accustomed to in the aquarium hobby, mysids are often wholly, or at least partially, planktonic in their habits. On reefs, and in other marine habitats, the careful observer often sees swarms of them moving over the substrate. They often cruise close to the surface, generally within a foot (30 cm) or so of the surface. 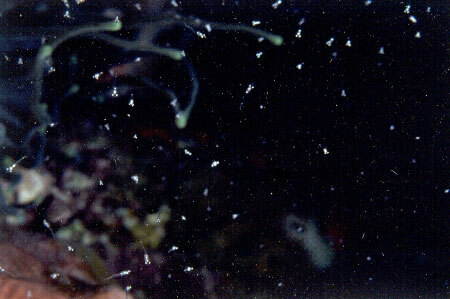 Such swarms are actually relatively common in many reef areas and provide food for many reef animals. Unfortunately, mysids from coral reef habitats have seldom been studied, so we really do not know much about their normal biological interactions. reflecting light from the camera's strobes. The mysids were about 0.25 inches (6 mm) long. The body shape and appendages reflect the mobile lifestyle of these demersal or "bottom dwelling" plankton. This is particularly evident in their appendages. Their thoracic appendages are not really well adapted for walking, instead they are designed rather for touch-and-go swimming. Although many species will "touch down" on the substrate, they don't really walk around much, and they seldom pick things off the bottom with their legs. This is in decided contrast to most of the other shrimpy animals we keep in our aquaria. These shrimps are supremely well-adapted to their bottom dwelling mode of existence. Not only are they very adept at walking around, such animals are constantly picking at things with their appendages tipped with pincher type claws. Mysids, in contrast, are almost always in motion as the following movie shows. Mysids are often animals that are at intermediate levels in food chains. They tend to be omnivorous, eating smaller planktonic organisms; both phyto- and zooplankton. In turn, they are eaten by larger zooplankton, often small fishes, or larger shrimps. Because of their tasty nature and small size, natural selection has undoubtedly worked on them to produce animals that are about as transparent as animals can be. 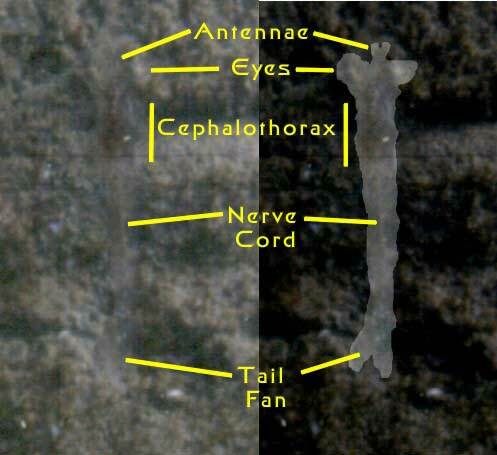 I have included an illustration taken of a single mysid resting on a sediment substrate, and about the only things that are visible are the eyes, and the thin nerve cord that runs down the center part of the bottom of the body. The rest of the animal is "visible" only as "space" where nothing else is seen. All of the guts, muscles, blood, and even food are transparent. When seen swimming, often the only things that are visible are the eyes and the statocysts. The latter are so small that the light and the animal's orientation has to be "just right" to see them. Even if the mysids in our aquaria are visible, as some of them are, they get mistaken for other things. 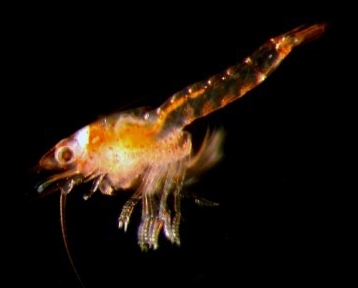 Because of their small size, shrimp-like demeanor and often slightly reddish color they are often assumed to be the larvae of cleaner or peppermint shrimps. In reality, the fragile larvae of these other shrimps probably don't survive for more than a few hours in most aquaria. resolution imposed by online imagery and the transparency of the animal. The animal was about 0.5 inch (1.2 cm) long. Small mysids thrive in reef aquaria, particularly those with refuge aquaria. Mysids are good food for a lot of small predators such as small fishes, and some of the zooplankton-catching suspension feeders such as many of the so-called Large Polyped Scleractinians. All that is necessary for their cultivation and maintenance is the presence of some safety zone in the aquarium, and some food. Although their natural food is unknown, I would suspect it is microzooplankton of the nature produced by the deep sand bed fauna, particularly the larvae of the numerous bristle-type worms found in such tank habitats. Frozen mysids may be found as food in pet stores, and some supply houses stock live ones, although these tend to be a bit expensive. Nonetheless, they are excellent foods for many marine animals, and are really a more natural food source than are Artemia. 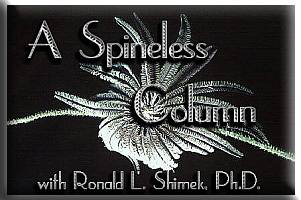 Some aquarists do culture them, and the culture methods are about the same as for Artemia. Mysids are much more muscular animals than are brine shrimp, and should be a more nutritious food source; however, like Artemia, they would themselves need to be fed for optimal nutritional quality. Like any live or frozen food as well, they will not be a totally balanced food source. They are, however, an excellent supplementary food. The McLaughlin reference cited below is the best brief description of anatomy of mysids, and the other general invertebrate and crustacean references will provide much supplemental information. Bliss, D. E. (Ed. ): 1982-1985. Biology of the Crustacea. 10 volumes. Academic Press, New York. McLaughlin, P. A. 1980. The Comparative Morphology of Recent Crustacea. W. H. Freeman and Co. San Francisco. 177 pp. Schmitt, W. L. 1971. Crustaceans. University of Michigan Press. Ann Arbor. 204 pp.